During the 1930s, the combination of the Great Depression and the memory of tragic losses in World War I contributed to pushing American public opinion and policy toward isolationism. Isolationists advocated non-involvement in European and Asian conflicts and non-entanglement in international politics. Although the United States took measures to avoid political and military conflicts across the oceans, it continued to expand economically and protect its interests in Latin America. The leaders of the isolationist movement drew upon history to bolster their position. In his Farewell Address, President George Washington had advocated non-involvement in European wars and politics. For much of the nineteenth century, the expanse of the Atlantic and Pacific Oceans had made it possible for the United States to enjoy a kind of “free security” and remain largely detached from Old World conflicts. 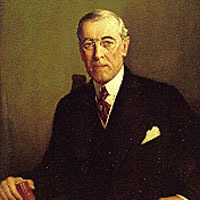 During World War I, however, President Woodrow Wilson made a case for U.S. intervention in the conflict and a U.S. interest in maintaining a peaceful world order. Nevertheless, the American experience in that war served to bolster the arguments of isolationists; they argued that marginal U.S. interests in that conflict did not justify the number of U.S. casualties. In the wake of the World War I, a report by Senator Gerald P. Nye, a Republican from North Dakota, fed this belief by claiming that American bankers and arms manufacturers had pushed for U.S. involvement for their own profit. The 1934 publication of the book Merchants of Death by H.C. Engelbrecht and F. C. Hanighen, followed by the 1935 tract “War Is a Racket” by decorated Marine Corps General Smedley D. Butler both served to increase popular suspicions of wartime profiteering and influence public opinion in the direction of neutrality. Many Americans became determined not to be tricked by banks and industries into making such great sacrifices again. The reality of a worldwide economic depression and the need for increased attention to domestic problems only served to bolster the idea that the United States should isolate itself from troubling events in Europe. During the interwar period, the U.S. Government repeatedly chose non-entanglement over participation or intervention as the appropriate response to international questions. Immediately following the First World War, Congress rejected U.S. membership in the League of Nations. Some members of Congress opposed membership in the League out of concern that it would draw the United States into European conflicts, although ultimately the collective security clause sank the possibility of U.S. participation. During the 1930s, the League proved ineffectual in the face of growing militarism, partly due to the U.S. decision not to participate. The Japanese invasion of Manchuria and subsequent push to gain control over larger expanses of Northeast China in 1931 led President Herbert Hoover and his Secretary of State, Henry Stimson, to establish the Stimson Doctrine, which stated that the United States would not recognize the territory gained by aggression and in violation of international agreements. With the Stimson Doctrine, the United States expressed concern over the aggressive action without committing itself to any direct involvement or intervention. Other conflicts, including the Italian invasion of Ethiopia and the Spanish Civil War, also resulted in virtually no official commitment or action from the United States Government. Upon taking office, President Franklin Delano Roosevelt tended to see a necessity for the United States to participate more actively in international affairs, but his ability to apply his personal outlook to foreign policy was limited by the strength of isolationist sentiment in the U.S. Congress. In 1933, President Roosevelt proposed a Congressional measure that would have granted him the right to consult with other nations to place pressure on aggressors in international conflicts. 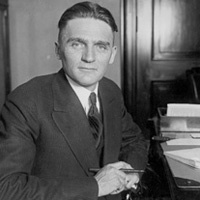 The bill ran into strong opposition from the leading isolationists in Congress, including progressive politicians such as Senators Hiram Johnson of California, William Borah of Idaho, and Robert La Follette of Wisconsin. In 1935, controversy over U.S. participation in the World Court elicited similar opposition. As tensions rose in Europe over Nazi Germany’s aggressive maneuvers, Congress pushed through a series of Neutrality Acts, which served to prevent American ships and citizens from becoming entangled in outside conflicts. Roosevelt lamented the restrictive nature of the acts, but because he still required Congressional support for his domestic New Deal policies, he reluctantly acquiesced.